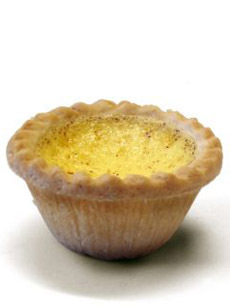 A custard tart. Also see our Custard Glossary. Photo by Mark Mordecai | SXC. This page contains terms such as cheesecake, cobbler and custard pie. This is Page 3 of a ten-page glossary. Click the black link below to visit other pages. See our many other food glossaries, each featuring a different favorite food. A Sicilian pastry, cannoli is actually the plural form of the word. 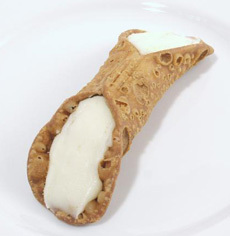 The singular is cannolo (cannolu in Sicilian dialect), meaning “little tube.” The crunchy, fried pastry dough tube (sometimes dipped in chocolate) is filled with a sweetened ricotta cream (sometimes mascarpone), which can be flavored with vanilla, chocolate, pistachio, marsala, rosewater and other flavorings. Chocolate chips or candied citron can be mixed into the filling; the open ends of the tube can be decorated with chopped chocolate or pistachio nuts. Cannoli range in size from finger-sized “cannulicchi” (mini-cannoli) to five inch-long tubes. Cannoli. Photo by Mike Connors | MorgueFile. You can also find “cannoli tarts,” made with a pie crust, filled with cannoli cream and generally topped with a strawberry. Plain pastry made with pastry flour and the addition of 1/2 teaspoon baking powder. The baking powder makes it almost as flaky as puff pastry. It is an especially good base for cream pie. 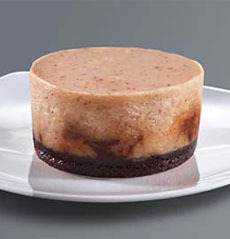 A cheesecake is actually a custard pie made in a springform pan. It generally has a bottom crust, although savory cheesecakes are often crustless and are served with crackers as an appetizer or as a first course (see our review of Savory Secret cheesecakes). The weight and texture of a cheesecake varies greatly according to the type of cheese used (cream cheese, ricotta cheese or cottage cheese, other cheeses for some savory recipes) and other recipe elements. There are light and airy cheesecakes, rich and dense cheesecakes and everything in between. Crusts can be pastry, cookie crumbs or bread crumbs. Cheesecakes made in a rainbow of flavors and are served chilled, plain or with a variety of topping including sour scream, fresh fruit, fruit toppings and sauces. See cheesecake royale, below. Toffee Crunch Cheesecake from PRPastry.com, maker of many delicious flavors of cheesecake. After the cheesecake comes out of the oven and cools briefly, a topping of sour cream and vanilla is baked on top of it for a final five minutes, creating a separate sour cream layer. Plain pastry with five tablespoons of grated cheese cut in with the shortening. This pastry is an ideal pairing with fruit pies, e.g., a Cheddar crust with apple pie. Cheese straws are strips of pastry, topped with cheese and baked until crisp. They are sometimes twisted for a more festive shape. 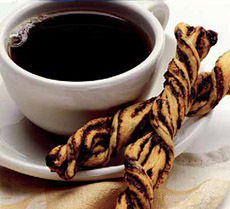 Today popular with cocktails, the original cheese straws are believed to be a result of leftover biscuit dough, which was mixed with cheese and rolled into long strips that were baked along with the biscuits to be enjoyed as snacks. There are also sweet cheese straws, flavored with cinnamon, citrus and other flavors. Read the history of cheese straws. Cinnamon cheese straws from John Wm. Macy’s, a NIBBLE Top Pick Of The Week. 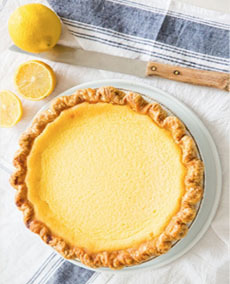 A Southern specialty, chess pie is simple pie of eggs, butter, sugar and vanilla with a cornmeal crust. It uses brown sugar in addition to white sugar, and some recipes use corn syrup as well. It is very sweet—like pecan pie without the pecans. The name has nothing to do with the game of chess, but, as this is the simple base for more complex recipes, may relate to the pie chest common in the early South, in which pies were stored (i.e., “chest pie”). Chess pie was a winter recipe, made when fresh fruit was out of season. Chess pie has a cornmeal crust. Photo courtesy Good Eggs | SF. Egg whites and gelatin are incorporated into a custard base to provide a lighter, fluffier filling than custard pie or cream pie. Examples include chocolate chiffon, coffee chiffon, lemon, lime, orange and pumpkin chiffon pie. For the holidays, chiffon candy pie with crushed peppermint stick candy, and egg nog chiffon pie, are popular. The recipe was invented by Monroe Boston Strause of Los Angeles. In his 1939 cookbook, Pie Marches On , he also lays claim to inventing the black-bottom pie. See also chiffon cake. Lime chiffon pie Photo courtesy Kraft. Choux pastry is used to make cream puffs, eclairs, and other pastries. 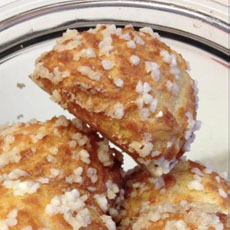 When the dough is simply baked with sanding sugar, it is known as a chouquette or sugar puff. 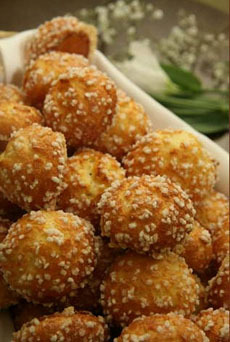 puffs of choux pastry, sprinkled with coarse sugar—very popular with French children. Chouquettes. Photo courtesy Mille Feuille Bakery | New York City. A sweet roll or yeast pastry made of layers of flaky pastry and rolled with a cinnamon and sugar filling, and often raisins and nuts. It is topped with is topped with a sticky vanilla icing or glaze. (See photo at right.) See also viennoiserie. 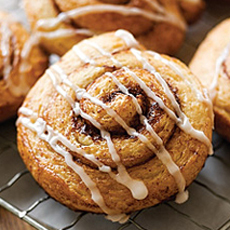 Cinnamon rolls available from MackenzieLtd.com. 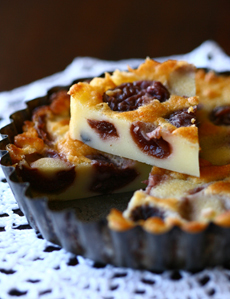 Clafoutis is a type of cherry tart of with pockets of fruit in a baked flan (custard) base. The fruit is covered with a thick batter and baked until puffy. The recipe originated in the Limousin region of France, where tart griotte black cherries were plentiful. Red cherries can also be used. When other kinds of fruit are used instead of cherries—apples, berries, plums, etc.—the dish is properly called a flaugnarde. The dish’s name derives from the old Occitan language of southern France: clafotís is derived from the verb clafir, meaning “to fill” (i.e., the batter is filled with with cherries). It spread to other parts of France in the 19th century. Clafoutis can be served hot or cold. Here’s a recipe from Foodbeam.com. Cherry clafoutis. Photo courtesy Foodbeam.com. A cobbler is a cooked fruit dish, but the topping is different from other cooked fruits with toppings. A crisp or crumble has a crumb topping (see below). Although some might see the cobbler as a crustless pie or “spoon pie” (a fruit pie with a filling so juicy it should be eaten with a spoon instead of a fork), it is often classified as a cake. Fruit is baked in a baking dish or casserole, then shortcake batter or biscuit dough is dropped onto the fruit before baking. The dish got its name because the lumps of cooked dough resembled cobblestones. Mixed berry and cherry cobbler. Photo courtesy of USACherries.com. Betty, crisp topped with buttered bread crumbs instead of streusel. Some later recipes substitute graham cracker crumbs. Buckle, a baked, bottom cake-like layer with the fruit mixed in, topped with a crumb layer (alternatively, the cake, fruit and crumbs can be three separate layers). Crisp, baked fruit filling covered with a crunchy topping which is crumbled over the top. 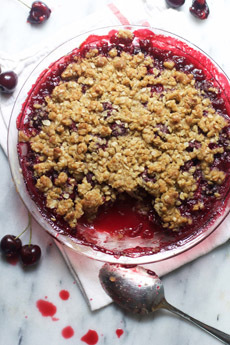 Crumble, the British word for crisp. Grunt, a spoon pie with biscuit dough on top of stewed fruit (fruit which is steamed, not baked). Pandowdy or pan dowdy, a spoon pie with a rolled top crust that is broken up to allow the juices to come through. Slump, another word for grunt, which can be baked or steamed, and can be made upside down. Hors d’oeuvres that include benne pastries (dough mixed with brown sesame seeds and Worcestershire sauce), cheese sticks, mini tarts and quiches, pinwheels (rolled pastry with various fillings (anchovy paste, blue cheese, deviled ham, mushroom) and miniature turnovers. Plain pastry to which a tablespoon of instant coffee is added. Ideal for cream pies. Strips of plain pastry or puff pastry, topped with a glaze of sugar and chopped almonds and sprinkled with confectioner’s sugar. Crème pâtissière or pastry cream. Confectioners’ sugar, also known as icing sugar, is a very finely-ground form of granulated sugar with the consistency of talcum powder. It dissolves quickly to make icing, and is used to dust a powdery garnish onto unfrosted cakes. 10x refers to the number of times the sugar is processed to produce fine powder. 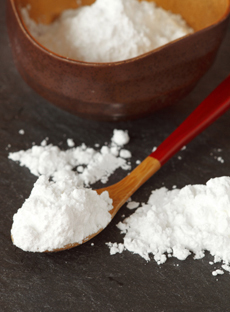 Commercial brands of powdered sugar are generally mixed with cornstarch, wheat flour, or calcium phosphate to improve its flowing ability, which is why it is not used to sweeten beverages. You can make powdered sugar by grinding table sugar in a coffee grinder. See our Sugar Glossary for more types of sugar. Confectioner’s sugar. Photo by Katharine Pollak | THE NIBBLE. Bottom and top crusts can be made from cookie crumbs: chocolate and vanilla wafers, ginger snaps, graham crackers and Oreos are popular examples. A cheesecake made with cottage cheese, often made in a crumb pie shell. A shepherd’s pie with a bottom crust, this traditional British dish serves up slow-roasted beef in gravy (season yours with garlic and mushrooms). 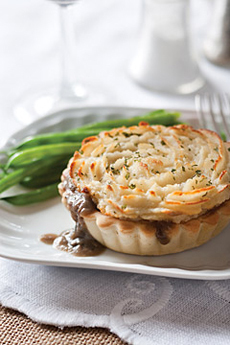 Like shepherd’s pie, the top crust is made of mashed potatoes, browned until they are crispy. A cream horn is an individual “cornucopia” made from puff pastry that is baked, cooled and filled with whipped cream or custard. The horn is garnished with cascading cut fruit and dusted with powdered sugar. A cream horn is a sausage-shaped pastry filled with custard and sprinkled with powdered sugar. The ends are typically garnished with chocolate sprinkles. Cottage pie. Photo courtesy of MackenzieLtd.com. A plain pastry or crumb pastry shell with a pudding filling (butterscotch, chocolate, frangipane and vanilla are most common). Try a banana cream pie, coconut cream pie or a strawberry or raspberry cream pie. What’s the difference between cream and creme? Just the spelling. Creme is an Americanization of the French word for cream, crème (pronounced KREHM), most likely adapted to make the dish sound more special. But why mispronounce another language’s word for cream? Unless it’s a French recipe, such as Coeur à la Crème, stick to cream. 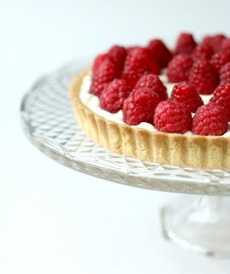 Raspberry cream pie: Here’s the recipe. Photo by Amber B | IST. Of those two pastries that people consider siblings, the cream puff and the éclair, the cream puff is the elder, dating back to the late 16th century. It is is believed to have originated in Italy with the head chef of Caterina de’ Medici named Panterelli, who invented a dough he called called pâte à Panterelli, later known as pâte à Popelin. Popelins were cakes made in the shape of large puffs. When Caterina moved to France to marry Henry, Duke of Orléans, her court included her chefs. The pastry was later perfected in the early 19th century by Jean Avice, a pastry chef at M. Bailly in Paris (famed pâtissier Sylvain Bailly had a shop near the Palais-Royal). Cream puff with a custard filling and powdered sugar dusting. Photo courtesy American Egg Board. Perfected by Avice and later by the great French chef and innovator Marie Antoine Carême, who was trained by Avice, this dough became the same as today’s pâté a choux. The elongated éclair did not appear until 200 years later, in the late 18th century. Both are made of pâte à choux (pot-ah-shoo, not pâté). Originally, the cream puff was filled with whipped cream and served plain (or late, dusted with powdered sugar). Now, the round pastry, which is piped from a bag and baked, is often halved, as in the photo at right. Profiteroles, cream puffs stuffed with ice cream and topped with chocolate sauce, are a 20th century dish. Today, both can be prepared in any way that the pastry chef can conceive, from pistachio whipped cream and glaze to saffron custard with caramel glaze to blueberry jam with cassis whipped cream and cassis glaze. Some cream puffs have chocolate-glazed tops, similar to the éclair. 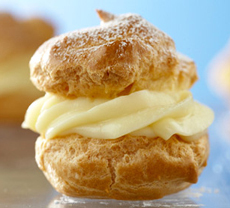 Here’s a recipe for cream puffs and a detailed instructions on how to make pâte à choux. Crème pâtissière, pastry cream, is a stirred custard (egg yolks and sugar with milk and/or cream) thickened with cornstarch or flour and typically flavored with vanilla (although other flavors can be used). See crème pâtissière in the photo of the cream puff, above. Crème pâtissière is the same recipe as crème anglaise, but the addition of the starch gives it the stability to be brought to a boil. It is used to fill éclairs and other pastries; inside fresh fruit tarts and flans, to fill cakes (it is added to buttercream to make mousseline filling for cake and pastry), etc. With the addition of beaten egg whites, it becomes crème Saint-Honoré, a filling for cream puffs. “Creme” is an Americanization of the French word for cream, crème (pronounced KREHM). It has been mis-adapted in the U.S. to make the dish seem more special. But spelling it “creme” and pronouncing it “cream” is just wrong. Why use a word from another language unless you pronounce it the correct way? Best advice: If it’s American, use cream, e.g., coconut cream pie. If it’s French, e.g., crème brûlée, use the accent mark and pronounce it “krehm.” Also see cream pie. Crème pralinée is crème pâtissière flavored with praline powder. It is used to fill pastries. A crisp is a deep-dish fruit dessert made with a crumb or streusel topping and baked. The British term is crumble. A cobbler has a pastry top instead of a crumb top). Also see betty. 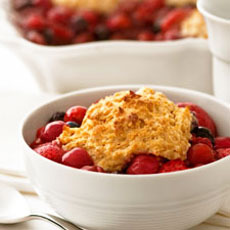 This wildberry crisp is available at MackenzieLtd.com. A crostata is a rustic style of tart baked free form rather than in a pan or mold. The pastry is rolled into a round circle, the filling is piled into the middle and the edges of the dough are folded up over the filling. The French word is galette. 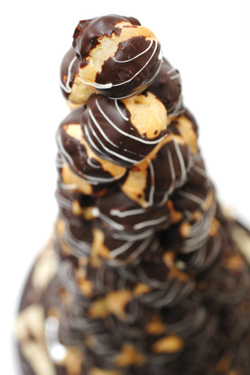 A towering croque em bouche, here covered in chocolate instead of caramel. Photo by Creacart | IST. Croustade is the French culinary term for crust or pie crust of any type. See crust below. A crust made of cookie crumbs or bread crumbs. See cookie crust. The thin layer of pastry covering lining and topping a pie. (Note: This term has other meanings with other types of food, e.g. bread crust and salt crust.) Pie crusts are usually made of flaky pastry or puff pastry, but crusts are also made from bread, cookie or cracker crumbs, crushed nuts, mashed or sliced potato, meringue, rice, semolina, shortbread and vermicelli. See pastry types. A sweet or savory mixture of milk and eggs that can either be baked or stirred on the stovetop. Stirred custards are softer than baked custards and can be used as a sauce (or the base for ice cream). Custards require slow cooking and gentle heat in order to prevent separation (curdling); stirred custards are generally made in a double boiler and baked custards in a water bath. Custards may be flavored. See our Custard Glossary. Custard is a combination of milk or creme plus egg yolks and flavoring, and can be baked in a pie or tart shell. Variations include caramel custard pie and coconut custard pie. Pumpkin pie is a pumpkin-flavored custard; cheesecake is a actually a custard pie flavored with cheese. 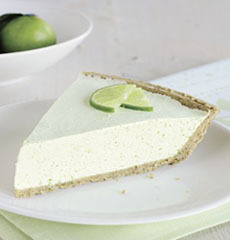 A Key lime tart is flavored with Key lime juice and often, the zest. 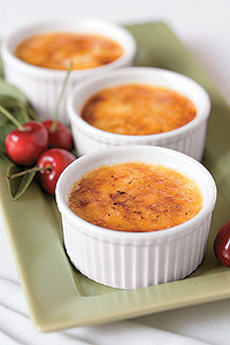 Crème brûlée, custard with a caramelized top, is available from MackenzieLtd.com.